As spring arrives in the land of Nog, Noggin is concerned that it is still unseasonably cold and worries about the year's future harvest. So cold, in fact, that large icebergs are floating past in the sea. He summons Olaf the Lofty to get to the bottom of the problem. Assisted by Knut, Olaf sets about constructing a number of weather balloons from whale bladders in the hope that they will be able to give some clue. As they fill one of the balloons with hot air and watch it drift out over the sea, they are surprised to see a figure appear on one of the distant icebergs and throw a spear at the balloon, bringing it clean out of the sky. The Nogs row out to the iceberg to investigate, and there they find Anook, one of the people from the land of the Midnight Sun from whence came Nooka. After enjoying a hearty meal, Anook the Nook tells Noggin that in his land, the weather has become strangely warm, so much so that the ice which forms their land has started to split and break into large chunks, floating away to melt in the seas of the warmer South. Realising that something must be done, Noggin calls upon Graculus to summon the help of the Orps, the giant birds from the high mountains. As the Orps scour the oceans for signs of drifting Nooks, the Nogs set about preparing the strange part ship, part island that had been driven by Nogbad the Bad in the tale of "The Island", which was now home to two mermaids. As the Nogs stoke up the great steam engine that powers the island and prepare to launch, Graculus returns bringing news that the Nook's village has been sighted drifting southwards and melting rapidly. Guided by Graculus, the Nogs on their floating island reach the Nook's iceberg just in time and a rescue is mounted. Although delighted to be rescued and to see their Princess again, the Nooks are uncomfortable in the heat of the South and Nan of the Nooks therefore declines Noggin's invitation to return with him to the land of Nog and so the island sets off for the North in an attempt to find a new land for the Nooks. Eventually they arrive at the polar ice-cap, and as the Nogs shiver whilst the Nooks rejoice, a huge flame bursts from the ice accompanied by a great noise, and a great chunk of ice breaks away from the mass. Not, however, before Noggin notices a shaft of iron break through the ice. The mermaids offer to dive under the ice to investigate, and once they have been equipped with sealskin suits to keep them warm, they disappear under the sea. As they swim down to the seabed, they encounter a strange house with the appearance of two boats, one upside-down on top of the other. They swim up to a window in the house and, looking in, see none other than Nogbad the Bad chuckling to himself. They tie a rope to the strange vessel and swim back to tell the others of their find. 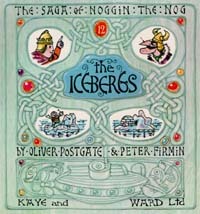 The Nogs haul on the rope, and soon bring in the submarine, out of which climbs Nogbad. Nogbad boasts of how he has harnessed the power beneath the sea and how, unless Noggin and the rest of the world yields to him, he intends to melt the polar ice-caps and drown everyone. Giving the Nogs time to contemplate his threat, he climbs back into his submarine and returns under the sea. Thinking about what Nogbad has said, Olaf surmises that Nogbad has discovered and tapped a supply of North Sea Gas, and the mermaids confirm his suspicions with their descriptions of pipes they had seen protruding from the seabed. Knut has an idea, and sends Graculus off to seek the help of the Orps once again. He gathers up Olaf's weather balloons, and briefs the mermaids. The mermaids dive back under the sea and tie the balloons to Nogbad's submarine. They then connect the balloons to the gas pipes and fill them with gas. As the balloons fill, the submarine rises with Nogbad sleeping peacefully inside it. As it breaks the surface, Noggin gives a sharp tug on the rope to wake Nogbad. Realising what has happened, Nogbad frantically tries to dive again, but by now the Orps have hold of the ropes. After a wild tug-of-war, the Orps lift the submarine with Nogbad inside and fly off to the East. Having deposited the Nooks on their new homeland, the Nogs return home in the floating island. As they sail past the great mountains, they greet the Orps and see the remains of Nogbad's submarine wedged high between two mountain peaks. On arriving home, Olaf is full of ideas about piping the gas back to the land of the Nogs, but a wise Noggin soon puts a stop to that.